Kamienica pod Aniolami i Wroclaw, Polen: Bestill nå! Are you planning a weekend trip to Wroclaw? We offer comfortable rooms with bathrooms. You will find us in the very center of Wroclaw. No matter if you are coming by train, plane or bus, you will reach us easily thanks to the good public transport connections. If you are travelling by car, you can use our parking space. The soundproof windows and thick walls will let you sleep undisturbed. 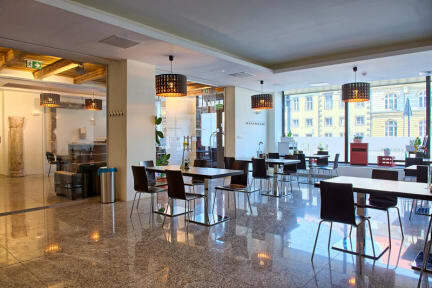 Our restaurant offers delicious breakfast, so you can set off to discover Wroclaw with a lot of energy. Kamienica pod Aniolami is located in the heart of Wroclaw on one of the main street just 2 minutes walking from the market square. You will reach the National Forum of Music (concert hall) in two minutes and you can enjoy a performance in the nearby Wroclaw Opera or have dinner in one of the restaurants around the White Stork Synagogue. Some of the rooms look out over the old tenement houses and residences of Kazimierza Wielkiego Street or over the inner courtyard and the Lutheran Church of God’s Providence (built in the 18th century as the Reformed Court Church for King Frederick II of Prussia). Are you looking for a venue to hold a conference, meeting or workshop? 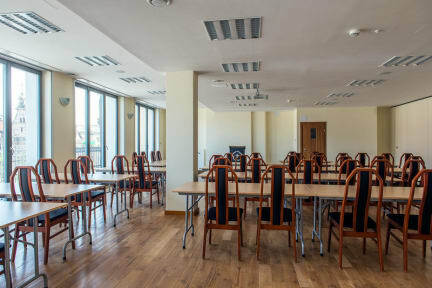 We offer a conference room to seat up to 100. The room can be separated into two different sections. A movable wall makes it possible to have two rooms with independent media and sound-systems. While having a break, you can enjoy the beautiful view over Wroclaw’s towers and rooftops. Since life is more than work alone, we would like to invite you to our restaurant for lunch or a cup of coffee. The restaurant can hold 50 persons. We also offer accommodation for 58 guests and use several parking spots for cars and minibuses. We will be happy to help you plan your free time, e.g. arrange a guided city tour. There is free Wi-Fi available in all rooms. Each floor is reachable by the elevator or you can use the carefully restored original staircase. Breakfast not included - 25 PLN per person per day.